Accuputt is a portable laser device designed to teach the user’s muscles to make the proper putting stroke. What makes it unique is the putter that comes as part of the system has a slot or aperture through which a laser beam passes. To practice turn on the laser, adjust the width of the putter’s aperture, place the putter so it straddles the beam and make a stroke. Simple and, as Ralph Blanchard, Accuputt’s inventor was looking for when he came up with the idea, it mimics the actual conditions while playing without lines, rails or other devices. After turning on Accuputt a green LED shows at the end of the practice pad floor unit showing the system is ready. The putter straddles the invisible laser beam and then just make a stroke. If the putter goes back to the inside or outside, anything buy straight back, the laser beam is broken, the LED changes to red and a buzzer sounds. A perfect straight back and straight through stroke doesn’t break the beam and by adjusting the width of the aperture in the putter a more precise motion can be practiced. The aperture at its widest setting does allow for a putting arc of 7 degrees on a take-away and follow through of about 12 inches. 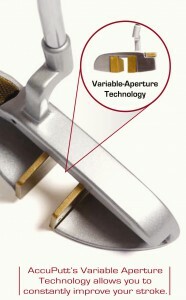 The arc tolerance lowers to a straight line as the aperture is reduced. The complete Accuputt system includes the floor unit and a training putter with adjustable aperture for $199 and may be purchased at www.accuputt.com.